Should I create more than one Facebook page? This article on creating more than one Facebook page is the first of a series on finding success on Facebook and social media. 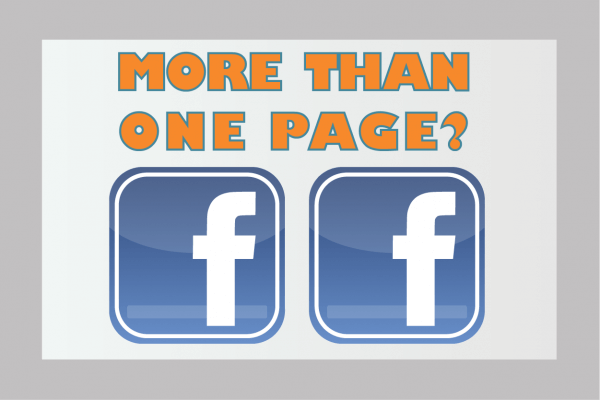 What are the benefits of creating more than one Facebook page? Many business owners ask if it makes sense to create more than one page on Facebook. You’d think that once you are done creating a facebook page, you can get to the business of social media marketing. Well, yes and no. Depending on your business and background, you may want to consider creating another page. With everyone else competing for your customer’s attention, a single page is rarely enough these days. More than one page will allow business owners the ability to reach a higher number of potential customers in a more targeted way. This approach can result in more sales and a more significant audience for your message. Do you have more than one location? A business with more than one location can benefit from more than one Facebook page. You own a restaurant in numerous locations and wonder if it makes sense to create a facebook page for each site. Consider that your restaurants are in different communities, and each area has unique demographics. There will always be times you will want to send messages to customers of one town and not the other. For example menus, promotions and events may all vary between locations. You may decide to have a fundraising event for a local cause, and it makes sense to promote it only in one area. Hence multiple pages allow you the option to keep your posts targeted to your audience. In doing so, you will achieve a better response rate and high-quality customer engagement. Do you have promotional campaigns that benefit your community? Whan it comes to cause marketing, more than one Facebook page can boost followers and engagement. Setting up a separate page to promote the cause can increase your audience and their engagement. This approach is especially true if your company’s promotional campaign has the dual purpose of promoting your business and bettering society. For example, your business is hosting an annual event to promote a particular cause. You may want to set up one page for your business and another for the fundraising event. Keeping your business and fundraising separate can result in more community interest on Facebook. Your company will benefit as a result. After all, people are more likely to identify with, “follow” and “like” a cause than a for-profit company. Does your business have a joint venture? When it comes to joint ventures separate Facebook pages are a must-have. The most obvious reason for more than one Facebook Page is when your company has a joint venture. In this case, setting up a separate Facebook page is a requirement. You will want to keep your primary business, and the new venture separated on social media. You can still leverage cross-promotional opportunities on Facebook. However, if that joint venture turns sour, you will want to escape the social media fallout which can harm both businesses. Managing more than one Facebook page can be a challenge. There is a downside to having more than one Facebook page for your business. The most obvious one is that having more than one Facebook page requires more work and makes things arguably harder to manage. Depending on what your budget allows you to do, though, you can outsource this aspect of your business. This may be a good option if it becomes too overwhelming or if you just prefer to focus on running your business. Duplicated posts are another issue you need to consider. You can end up annoying your audience by posting the same message on all your pages. The reason is that they may end up getting the same thing more than once if they are following all your pages. If you want to publish on more than one page, allow for a day or two to pass. Now the message will serve as a reminder instead of an annoyance. Therefore be selective where and when you make your post to avoid losing followers. If you want to stick with one page, you can use Facebook’s Targeting feature. By using it, you can decide exactly which segment of your audience is going to see a particular message you post. This capability will cost you money, so if a primary goal is to generate as much free exposure as possible, then more than one facebook page is the best approach. The best Facebook strategies involve having one page to promote your business and other pages to target the diverse interests of your customers. This approach could be as simple as a separate community page for your local area where you can build an audience by posting great content. While doing so, you can discretely promote the name of your business and your local services. When goals of your business and the community work well together, it can become a recipe for success. Some local service providers don’t need to sell on Facebook, just be visible. Creating multiple Facebook pages is an excellent option for marketing for service providers like Realestate Agents, Lawyers, and Financial Advisors or other professions. Because the name of the business and your reputation are closely tied, it may not be necessary to promote your business at all. It is all about name recognition. Hence if you achieve high name recognition from social media, it can give you a high ROI for your business without you even needing to promote your business. What are my options for creating a Facebook page? Creating a Facebook page is the first essential part of achieving social media marketing success on Facebook. But since there are multiple types of Facebook pages the following tips will help you decide the right choice for you and your business. This category is for Radio stations, magazines, and TV channels, as well as anyone else whose primary role is to entertain others. If you have a local band, you may want to hold off on this option and continue reading as there is another category that is better suited. Although charities and similar organizations will find this type entirely relevant, it is not exclusive to non-profits. It can also be used for community groups or special interests. The purpose of these pages is to focus on and raise awareness of concerns that benefit society. However, this option is not just for non-profits because the power of cause marketing can bring huge rewards if done right. Just look at the NRA for an example of a cause with a substantial presence on Facebook and an industry that makes a lot of profit. Local business owners can generate substantial business, brand awareness and goodwill if they use this feature to promote a favorite social cause. This category is straightforward. If you have a physical location your customers can visit, this one is a no-brainer. If you’re still not sure, go through the category list provided by Facebook. There, you will find various examples, and you can use them to help you determine whether this category is the right choice for your business. If you’re a known writer, actor, a politician running for office, artist, etc., then this is a good match for you. As you can see, there is a bit of an overlap with the ‘entertainment’ category. Just use your best judgment when making a choice and look at the examples provided by Facebook. Choose this option instead of ‘local business or place’ if your business has more than just one physical location. Each of these may have a different schedule, address, and open hours. However as stated above there are benefits to having separate pages for each location so you will want to give this some thought before jumping in. Now that you have picked a category you will also find that each category has many sub-categories. In fact, there are too many to cover in this article. Just take your time picking the right one, and remember you can always change the category later. Facebook groups have filled the shoes of what online forums have served in the past. The traditional public forums are still not dead, but think about it: it’s much easier to get someone to join your discussion group directly on Facebook rather than having them leave the site and visit some other domain. Doing so would require much more work on their part since they’d probably need to register for an account as well. On the other hand, while they’re on Facebook, they can post directly from their existing account. Facebook groups can be better than Facebook pages since they allow like-minded individuals to connect, share their thoughts, and achieve common goals. And yes, everyone can create a Facebook group! Some of them are public, and some of them are private (also known as invite-only). There are two ways you can use Facebook groups to promote your business. You can try to build a community from scratch, but this will take time and resources to develop the group. You can come up with meaningful replies to existing group posts in your niche. This approach will let you will grab the users’ attention and divert it towards your business. Regardless the approach you take, make sure all your posts are helpful, meaningful and that they are designed to help solve someone’s problem or give some solid advice. More than one Facebook page or group, when done with care, can be a good strategy for social media marketing. So the verdict on whether you should have multiple Facebook pages or not is as follows: it depends. The primary considerations are your goals, resources, purpose, the number of physical locations you have, and other variables. Now you are ready to get started on Facebook. Creating an engaging page and building an audience is your next step. You can take advantage of the knowledge to gained from this article those that follow to get an edge over your competition. Not everyone uses these social media tactics, so there is plenty of opportunity on Facebook. If you feel social media management is too time-consuming or complicated, our team of social media consultants is available to help. Call 978-851-9077 for a free consultation.